Manual Steel Cutter-Shear SIMA C-6/22 Max.Ø Cutting: 22mm.High durability cutting blade which makes a clean cut. Manual Steel Cutter-Shear SIMA C-6/22 Max.Ø Cutting: 22mm. The SIMA C-6 is a high-quality lever-operated manual steel cutter which incorporates a high durability cutting blade so that you can make a clean cut every time with very little effort. The chassis is made from welded steel. The blades of the cutting jaws are interchangeable and can be easily replaced if they get dull from extensive use. Quick and easy operation and low maintenance. This manual steel cutting shear can be used to cut smooth or corrugated rebar up to 22 mm in diameter. It is designed to be screwed onto a flat, stable work surface using the four integrated attachment points. For multiple cuts, the operator simply needs to manually advance the steel bar through the opening between the cutting jaws. Electric rebar cutters and SIMA C-6 manual rebar cutters for larger diameter rebar cutting are also available. For the best quality, value and service, buy direct from the manufacturer. SIMA offers free shipping and returns on manual steel cutters for customers in the UK. ✅ Manual steel cutter makes a quick, clean cut with minimal effort. ✅ Cuts smooth and corrugated steel rebar up to 22 mm in diameter. ✅ Any inner components which are subject to continuous wear and stress are tempered to ensure longer working life. ✅ Higher traction force and smooth running thanks to its oil bathed trapezoidal and helicoidal gears, ensuring top performance for heavy users and minimizing maintenance. ✅ SIMA C-6-22 is built with four anchoring points for attachment of the manual steel cutter to a sturdy work surface using screws and a drill. ✅ Interchangeable 4 faced long life cutting blades, rectangular shaped and made of chrome-steel. ✅ Support screw braces rebar to hold steady while cutting. ✅ Comfortable and ergonomic lever multiplies force for a clean, safe cut with little effort on the part of the operator. ✅ Integrated lifting hook and lever plus transport wheels to facilitate final positioning at site. ✅ Long working life and top performance. ✅ We are manufacturers. Buy direct for the best quality steel cutters and other equipment with the best value and service. 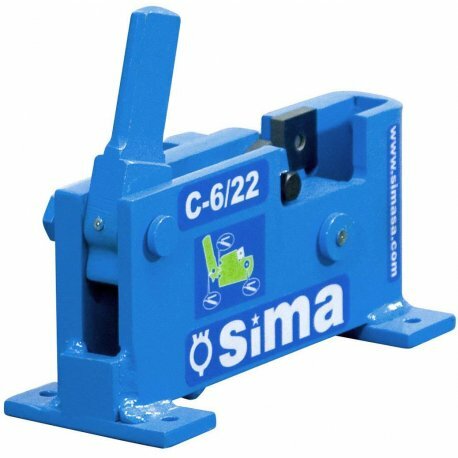 ✅ Free shipping and returns on our SIMA C-6-22 manual steel cutter in the UK. Integrated lifting hook and lever plus transport wheels to ease final positioning at site.